I am a professional photographer available to capture your most cherished events. I am a freelance photographer specializing in event photography. In my 41 years as a professional photographer, I have had the honor of photographing anniversaries, artists, churches, concerts, conferences, engagements, personalities, portfolios, portraits, reunions, weddings, and many other large gatherings. It is my mission to capture those once-in-a-lifetime moments in time for eternity. These are the qualities you expect from your photographer, and I am committed to exceeding your expectations. MOMENTS IN TIME with Milton Williams, photographer. Zimbabwe Africa; Senator Barack Obama; Rev. 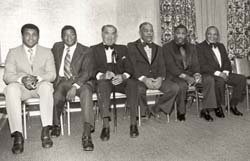 Dr. Martin Luther King Sr; (Daddy King); Dr. Benjamin E. Mays; Martin Luther King III; Katie Congresswoman Beatrice Hall; Congressman George Thomas "Mickey" Leland; photographer Maurice Sorrell ; President BarackObama;Congresswoman Donna Edwards; photographer Joseph Daniel Clipper; Rushern L. Baker; Vincent C. Gray; Rev. Samuel "Billy" Kyles. To view MOMENTS IN TIME page, click here. photographer Roy Lewis; Gil Scott Heron ; Norris "Brute" Little; Teddy Penderglass; Samuel F. Yette; We the People: Vanessa Williams; Suzanne Charles ; Kado Wilks Sr.; McCoy Williams Sr.; Dr. James H. Johnson Jr. and James Henry Johnson Sr.(family); Dr. Pauli Murray; Donna Wells, photographer Maurice Sorrell; Effi and Christopher Barry ; George B. Murphy; Charles Herbert Stockton Jr.; To view MEMORIES page, click here. Elizabeth Hobbs Keckley; Thomas R. Hawkins; Osborne Perry Anderson; Christian Abraham Fleetwood; American Indian Movement (AIM); Howard Cossell; Muhammad Ali; Donny Hathaway; Aretha Franklin, Phyliss Hyman; Stokey Carmichael / Quami Toure; Myrlie Evers-Williams; Fannie Lou Hammer; Mayor Richard Hatcher; Benjamin Hooks; Vernon Jordan; H. Carl Holman; Patricia Harris; Maynard Jackson; Charlene Drew Jarvis, Ph.D; Rev. 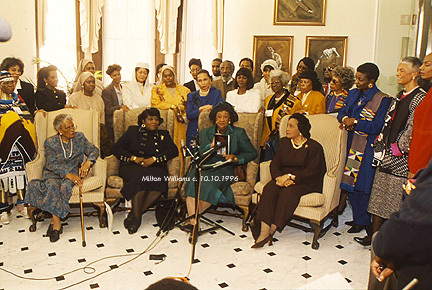 Al Sharpton; John H. Johnson; Cissy and Thurgood Marshall; Daisy Lee Gatson Bates; Dr. William O. Walker; Patricia Harris; Alice Allison Dunnigan; General Olusegun Obasanjo; William Richard Tolbert and Victoria A. Tolbert; Pookie Hudson and the Spaniels; Tito Puente and Celia Cruz; Coretta Scott King, Betty Shabazz and Dorothy Irene Height; Nelson Rolihlaha Mandela; Colonel Clarence Edwards; Michael Angelo Graham; Petey Greene; the Clovers; The jewels; Sonny Till and the Orioles; Flip and Pearl; Arthur Wilmer; Civil Rights photographer Charles Moore, photographer Milton Williams and Civil Rights photographer Ernest C. Withers; photographer Oggi Ogburn; Benjamin Quarles, Phd. ; Deborah Willis; Dr. Chancellor Williams, Phd. ; General Daniel "Chappie" James, USAF; General of the Army Omar N. Bradley; artist Daniel Ruben Wynn; Sylvia Y. Cyrus; Sugar Ray Leonard; To view EVENTS page, click here. Julian Bond; Lerone Bennett Jr. and Coretta Scott King; Pope John Paul II; artist Simmie Knox; photographers Roland Freeman, Ellsworth Davis, Prentice Pope, James VanDerZee, Robert Scurlock, Sam Courtney, Don and Ron G. Baker; Ron Ceasar; Jason Miccolo Johnson;Queen Elizabeth II; James Earl Ray; Pele, R. Sargent Shriver and Eunice Kennedy Shriver; photographers Maurice Sorrell, Joe Brooks, Oggi Ogburn, Jim Wells, Sharon Farmer; Wilhelmina A. Rolark, D .C. Ward 8 City Council member ; Ron and Alma Brown, Andrew F. Brimmer Phd. ; President Ronald Reagan and Egyptian President Anwar Sadat; Billy Eckstine; Aris T. Allen; Mack Herron; Lenny Moore; Franco Harris; Carlos Rosario;Walter E. Washington; Sharon Platt Kelly; Marian S. Barry Jr.; Michelle Alexander Phd. ; Cliff Alexander; E. Ethelbert Miller . To view PERSONALITIES page click here. Muhammad Ali; Stevie Wonder; Milton Williams sister Marian A. Williams; Dr.Betty Shabazz; Vernon Bellecord; Stevie Wonder; Marlon Brando; Dr. Michael Eric Dyson; Roger Wilkins. To view PERSONALITIES II page click here. Richard Pryor; Milton Williams; James Brown; Calvin Rolark; Jean A. Fugett Jr. Esq. ; Maureen Bunyan; Ethel Payne; Max Robinson; Mel Goode; Lon Walls; Art Carter; E. Fannie Granton; Dwight M. Ellis; Pope John Paul II; President Jimmy Carter; Senator Blanche K. Bruce; Congressman John Mercer Langston; Ruth Jenkins; Oscar V. Little Phd. ; Harold Little Sr.; wife Sheila L. Williams; Milton Williams; Dr. Betty Shabazz; Wilfred Edgerton Little; Hilda Little; Bishop Norman N. Quick; Malikah Shabazz; Attallah Shabazz; Qubilah Shabazz; Malaak Shabazz; Gamilah Shabazz; Ilyasah Shabazz; Daryl Michael Scott Phd. ; Lonnie G. Bunch Phd.;Mrs. Eleanor Baltimore; Melvin Deale Dancers; Sandy Feldman; Barbara VanBlake; Dr. Dorothy Irene Height; my mother Dorothy Mae Thomas Williams. To view Memories II page Click Here My 1976 WBA Heavyweight Champions photograph of Muhammad Ali, Floyd Patterson, Jack Demsey, Joe Louis Barrow, Joe Frazier and Jersey Joe Walcott and a 1978 photograph of Muhammad Ali and Stevie Wonder at a American Indian Movement benefit was accepted on November 4, 2008 as a donation to the Muhammad Ali Center, Louisville Kentucky.